PARIS, April 11, 2019 /PRNewswire/ — Africa seems to be on every investor’s radar these days, and for just reason. No day goes by without a mention of “Africa investments” in the headlines, according to research conducted by Born2Invest on investing in Africa. Case in point, a few short days ago the country of France pledged $2.8 billion in towards business investment in Africa by 2022. The idea behind this marquee investment is to “support about 10,000 enterprises across the continent by providing credit, technical support and equity financing,” according to the French Development Agency. Business investment in Africa is far from being a novel concept. However, what is more striking is the fact that startup investing across Africa is quickly gaining ground. The year 2018 witnessed record levels of startup investment activity in Africa, with a four-fold increase in total startup funding, with 30 startups raising individual rounds higher than $5 million across 32 deals valued at $626.9 million. The AFRICA MOVES Big Summit – to be held in Tunis from June 17-21 – will serve as the backdrop for this investing trend. Labeled by many as the “CES for Africa“, the Big Summit represents in many ways an idea whose time has come. The mega event will attract more than 8000 professional attendees and 1000 decision-makers over a 5-day period running from Monday through Friday, and featuring 200+ African startups, 150+ guest speakers hailing from dozens of countries, 100+ round tables. The event will be held on the premises of the sprawling, 23-acre Cité de la Culture in Tunis, Tunisia, a place of exceptional beauty that features over 20,000 sqm2 of exhibition floor space. The event is organized by EDN, the Entrepreneurship and Diversity Network. EDN is an international non-profit organization thatoffers an acceleration, incubation and mentoring model emphasizing actionable business opportunities, no matter the industry or sector of activity. Media sponsors for the event cover both English and French-speaking markets and include Born2Invest, leading French weekly business publication, La Tribune (France), La Tribune Afrique, Maddyness, a digital magazine entirely dedicated to French startups and IC Publications, a media group that represents Africa-centric titles such as the New African, African Business, African Banker and New African Woman. “We believe that AFRICA MOVES will redefine the African startup landscape, by creating a much-needed bridge between startup entrepreneurs, sources of capital and the media,” said Dom Einhorn, member of the event’s Steering Commitee and Director of Investor Relations. If you are an accredited angel investor, investment fund or other financial institution, please register for the event using this form. 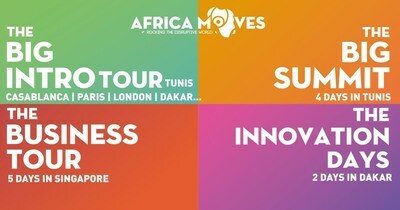 If you are an African startup interested in exhibiting at AFRICA MOVES, please consult this form for consideration and vetting.